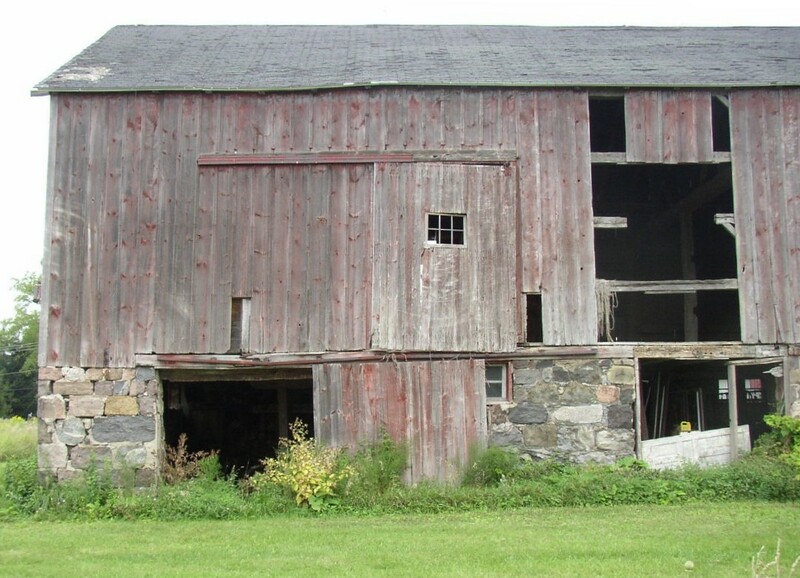 The following assessment of Sutherland-Wilson Barn was prepared by Steve Stier and submitted to the Pittsfield Township Historical Society on 22 September 2004. Captions: (1) View of barn, from the rear. (2) Front view of barn. 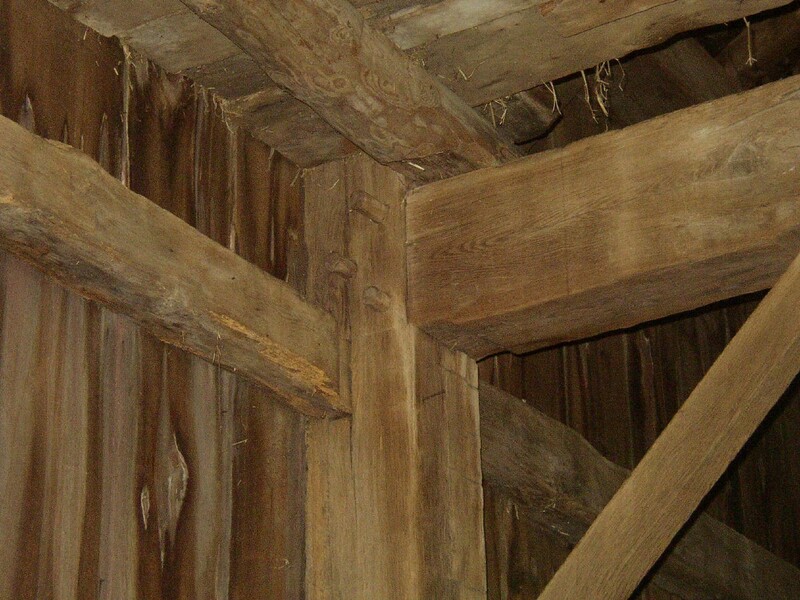 (3) View of hand-hewed beams in barn and notched construction. (4) View of logs used to support the barn roof. The barn can be described as a rectangular (Approx. 32� x 58�), gable roof, five bent, four bay raised, and ramped barn. The foundation is of unusually large dressed stone and lime mortar. There is evidence of black colored mortar tuck -- pointing. There is a poured concrete silo base to the east of the drive floor ramp of about 14� dia. The siding is 1� x 12� pine boards with beveled end joints and beveled batons. The roof is relatively flat and the covering is wood shingles with at least one layer of asphalt shingles over. There is about 8� overhang at the gable ends and eaves and the soffits at the ends and front are closed. The original three bay barn has a 12� west bay, 14� drive floor and a 16� east bay. A 16� bay has been added on the east. It appears as if this was done at a time of beginning or increasing dairy production. The milking stanchions, the silo and the haying equipment could have been added at the same time or in two or more phases. The timber-frame is typical for mid 19th century barn construction with some exceptions. First there is a high percentage of hewn members, The wall girts (horizontal beams between posts that support siding) are uncommonly large and hewn, rather than sawn, which is typical. Second, the Tamarack pole rafters are lap joined and pinned at the peak, which is quite unusual. There is an enclosed granary taking up the south two-thirds of the west bay. It is constructed of wide 1� thick circular sawn pine boards, fastened with cut nails. The drive floor south wall has a ventilating door and the next bay east has siding removed and the upper wall girt is partially removed. The rafters are supported by a purlin, and vertical purlin posts which extend to tie beams below. The plate and purlins are all spliced between bay 3 and 4. 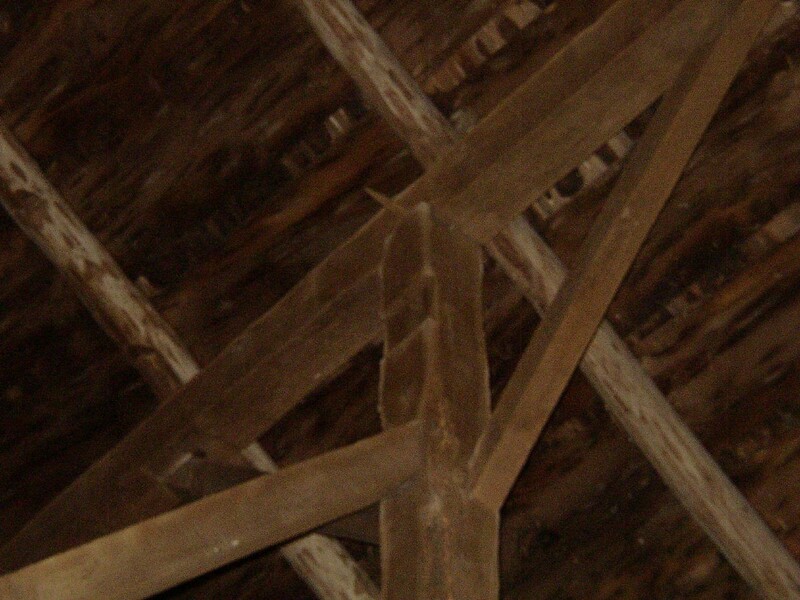 The barn originally had purlin ties that joined purlin post pairs near the top. These have all been removed, most likely when the hay track equipment was installed. There is a wooden hay track hung slightly off center at the peak and the hay car is still there. All the stones in the foundation seem to be in correct position. However much of the original pointing and integrity of the underlying mortar joint has deteriorated. The south section of the foundation wall between the two large door openings is leaning outward at the top. The grade around the foundation is sloped in such a way as to allow surface water to drain into the foundation wall and into the lower level which collects on the dirt floor. There are two locations on the sill that are seriously deteriorated. The first is at the drive floor entry, and the other is directly across on the south wall of the drive floor. The southwest drive floor post is sinking due to sill rot. All other sills seem to be in good condition. The siding boards and batons are in fair condition, and has paint that is faded and peeling. A portion of the south wall has been cut out and is missing. The doors on the lower level generally are missing or inoperable The doors on the upper level are marginally operable. The upper level floor has isolated major deterioration in the north west corner due to roof leak. This appears to be restricted to the floorboards but floor joist need closer inspection before repair. All of the framing members above the sill seem to be in good condition with no significant rot or structural problems. The purlin tie beams have been cut out and are missing. The roof framing seems in good condition with no or little rot. The rafters are straight and seemingly well supported. Most roofing boards appear in good condition with many having signs of intermittent roof leaks. There are several areas where the roof covering and sheathing have completely failed. The general condition of the roof covering is very poor, with several areas of deteriorated sheathing. 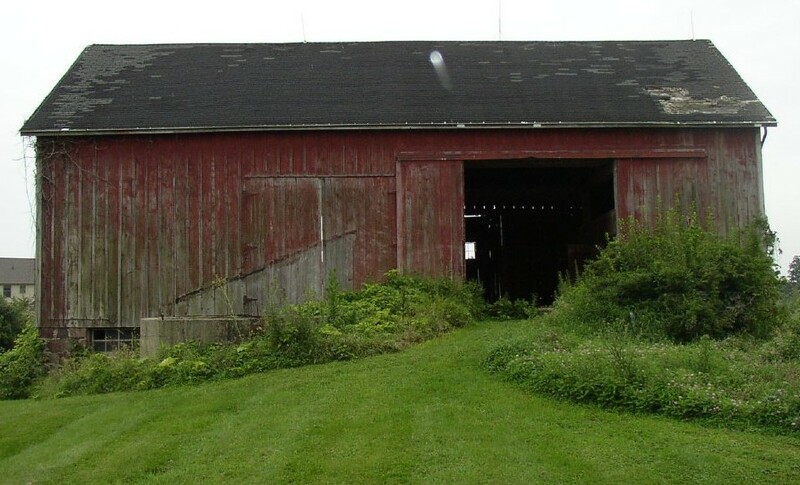 Generally the barn is in very good condition, with much of the work needed being maintenance, and minor repairs. The major problem areas are the roof, the sill repairs and the foundation repair and mortar re-pointing. Though the original roof covering material was wood shingles and would be the ideal replacement you should not reject steel or asphalt shingles on a purely historic basis. If finances are a concern, a less expensive roof may be more prudent, to free up money for other important repairs and site development. I think a new roof may be installed before other structural repairs are done. This, however, will depend on the type of roof and the opinion of the roofer. Because the roof is the highest priority this needs to be decided as soon as possible. Sill repairs most likely will be done by a different contractor so separate roof and sill specifications may be needed. Be extremely careful when removing items from the barn and other buildings. What looks like junk to most folks may be an important artifact and give us lots of clues about the history of the farmstead. I think that a wooden silo could be found to replace your missing one. Please give some consideration to this when forming your plan. It may be possible to handle a large portion of the foundation re-pointing by using volunteers (though not straightening the leaning section). I can envision an all day training class co-sponsored by your group, and possibly the Michigan Barn Preservation Network and the Michigan Historic Preservation Network. You would need a core group of half a dozen or so to complete the work but this could be a win-win project for all involved and would certainly bring publicity to your site. This could be done best in the spring of 2005 -- a Saturday in May-April would be best.